On October 11, UCLA Library Special Collections will host the Bonnie Cashin Lecture by Paul Bauer and Mark Dawidziak, entitled “Rediscovering Jim Tully: Golden Age Hollywood's Hard-Boiled Writer” at 4:00 in the Charles E. Young Research Library Conference Center. Bauer and Dawidziak are authors of the biography, Jim Tully: American Writer, Irish Rover, Hollywood Brawler, published by Kent State University Press in 2011. The lecture will be followed by a reception in Library Special Collections for the opening of the accompanying exhibit, “The Life and Times of Jim Tully—From Drifter to Celebrated Author” curated by Lilace Hatayama. 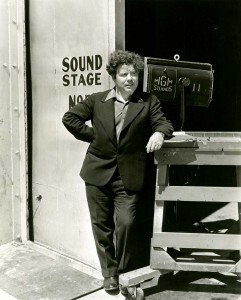 The exhibit will feature selections from the Jim Tully Papers, including drafts of his novels and first editions, correspondence with Hollywood celebrities, sports figures, writers, editors, and screenwriters, research files for his non-fiction pieces, photographs with celebrities of the day, and mementos of his strong ties to his hometown of St. Mary’s, Ohio. Space is limited; RSVP by October 2, 2012 to UCLA Library Development at 310.206.8526 or rsvp@library.ucla.edu. Jim Tully (1886-1947), once known as “the most feared man in Hollywood,” rose from an impoverished childhood in St. Mary’s, Ohio to become an internationally known novelist and popular writer. A self educated “road kid,” he traveled the country working odd jobs and hopping trains. Tully found work as a tree trimmer, boxer, reporter, and chain maker before settling in Hollywood and working for Charlie Chaplin. He published his first novel, Emmett Lawler (1922) based on his own family history and travels, while also establishing himself as a keen observer of Hollywood and the cult of celebrity. He wrote a series of best-selling novels, contributed to countless magazines and literary journals, and included hobos, convicts, Hollywood stars and American literati amongst his friends. UCLA Library Special Collections houses Jim Tully’s papers, which contain manuscripts of novels, short stories, articles, plays and celebrity profiles written by Tully, as well as research material for his varied interests, including pugilism, prison reform and capital punishment, hoboing, labor strikes and many other topics. There is extensive correspondence with Hollywood celebrities, directors, studio executives, literary figures, and family and friends, including one of Tully's mentors, H.L. Mencken. The papers also include photographs and personal material about family history, marriages and travel. The collection is available for research and the finding aid for the Jim Tully Papers on the Online Archive of California provides extensive information regarding its contents and scope. By Lilace Hatayama, Literary Manuscripts Specialist and curator of “The Life and Times of Jim Tully–From Drifter to Celebrated Author” Selections from the Jim Tully Papers. American Cinematheque will screen 1933’s “Laughter in Hell” based on Tully’s 1932 novel of the same name. Tully biographers Paul Bauer and Mark Dawidziak will introduce the film and conduct a Q&A after the screening at the Egyptian Theater, 6712 Hollywood Boulevard, Los Angeles, CA 90028. Los Angeles Visionaries Association (LAVA) presents the fourth of the quarterly LAVA Salons at Musso & Frank Grill, 6667 Hollywood Boulevard, Los Angeles, CA 90028. Bonnie Cashin (1908-2000) was one of the foremost American fashion designers in the second half of the twentieth century. At the vanguard of her field for nearly forty years, she had an enormous influence on twentieth-century design. Her oft-stated credo, “Chic is where you find it,” sums up her belief that designers should possess a habit of wonder and an ability to connect the fashion world with objects and ideas not usually associated with it. In the summer of 2003, UCLA Library Special Collections acquired the Bonnie Cashin Archive as a gift from the Cashin Estate. In addition to Cashin’s personal papers, the Estate provided an endowment to establish the Bonnie Cashin Lecture Series. The series brings to UCLA gifted individuals from a variety of disciplines to celebrate the creative process, and to preserve the legacy of Cashin’s remarkable life and work.